Signature Iron Doors crafts a wide variety of ornamental iron products. Our iron double doors are leading the market due to their beauty, durability, and security. All our iron is hand forged and welded in many different designs. This is a door built for a customer near Glendale Arizona. 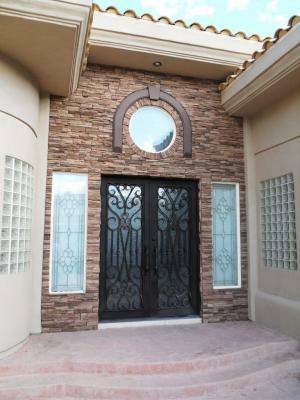 Call us or come visit our showroom in Phoenix Arizona to discuss with a sales representative how you can obtain a Signature Iron Double Entry Door.